This was actually LAST year’s costume. Last year Alex absolutely refused to wear it. He made ME wear it. 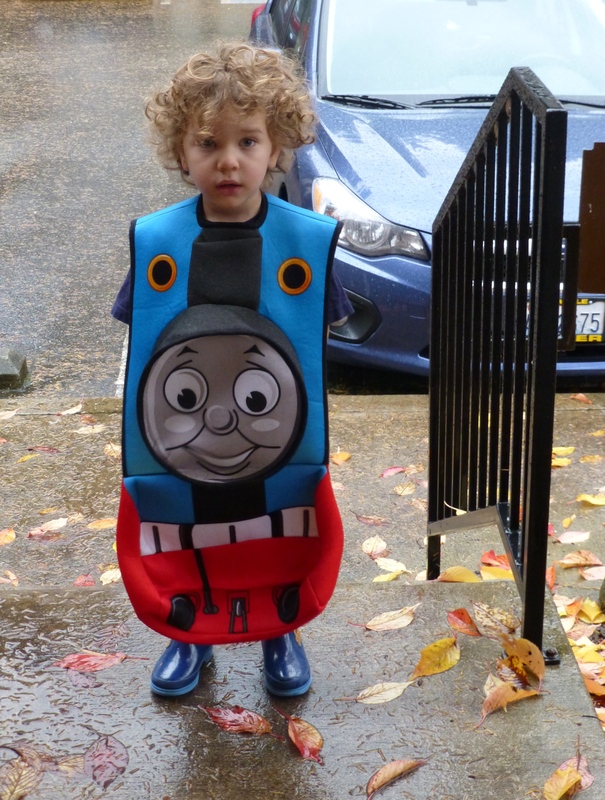 So we went around trick or treating with Daddy in the Thomas the Tank Engine costume, and Alex mostly in arms. This year, Brandy spent hours showing Alex costumes online, with him systematically rejecting every one. Until he saw one of Clifford the Big Red Dog. He was excited about that one. He wanted that one. It was ordered. It arrived. He spent the last week talking about his Clifford costume and trying it on a few times. This morning though, when told that kids were wearing costumes to school today, he decided he did not want to be Clifford. He wanted his costume from last year. He wanted Thomas. So he went to school as Thomas. He did agree however that he still wanted to be Clifford for Trick or Treating tonight. We’ll see if when it is actually time for trick or treating in an hour or two if he still wants to switch to the Clifford costume. 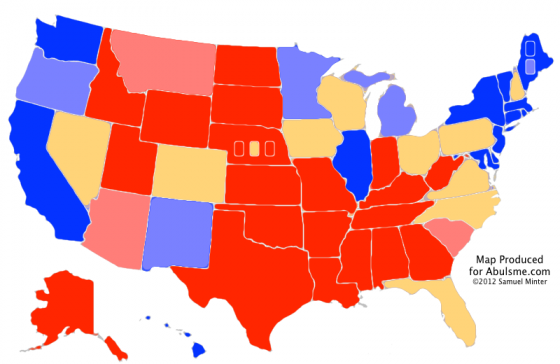 One state changes categories today. It is Florida. 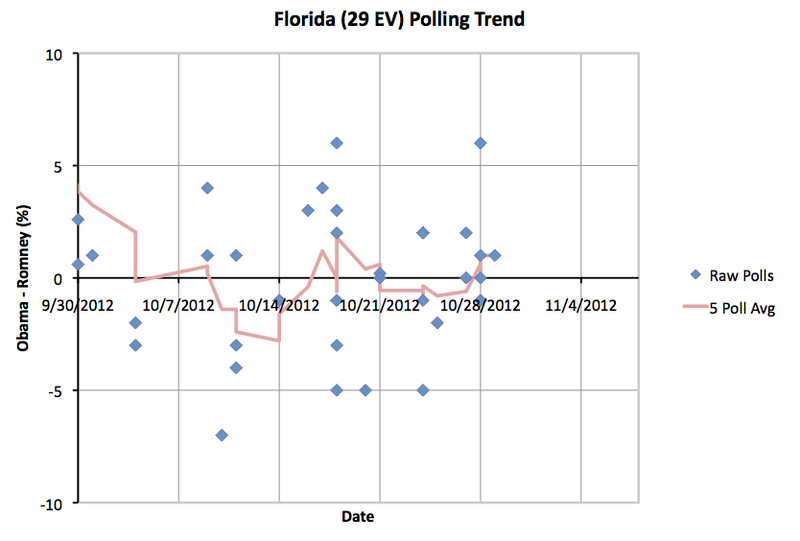 As I’ve cautioned before with Florida (and a couple other states), the state is close, the five poll average has bounced back and forth across the line repeatedly. The average today moves slightly to the Obama side of the line. But it could easily go back to the Romney side of the line tomorrow. There have been no moves that indicate Florida is moving definitively toward one candidate or the other. Absent such a move in the next few days, we’ll basically just need to wait for the actual vote count. Hello old friend, it is nice to see you again! Once again we have a 332-206 Obama victory, which is where the “Current Status” line has been more often than anywhere else all year long. There have been moves above this, and moves below this, but so far, things have always come back here. I guess we’ll see if that holds through election day. What looked like a slight trend in Obama’s direction looks more significant today. With today’s update Obama’s lead in Ohio increased to 3.3%. This actually moved Ohio past Nevada, where Obama’s margin is now 3.2%. This makes Nevada the new “tipping point state”. Romney’s easiest path to victory is now holding on to all the areas he is ahead in, then erasing Obama’s advantage and taking the lead in Virginia (13 ev, 0.9% Obama lead), Florida (27 ev, 1.0% Obama lead), Iowa (6 ev, 1.2% Obama lead), Colorado (9 ev, 2.0% Obama lead), New Hampshire (4 ev, 2.2% Obama lead) and then Nevada (6 ev, 3.2% Obama lead). 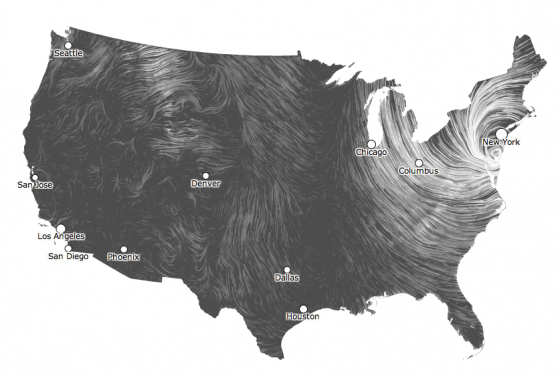 Ohio may well return to the tipping point position tomorrow, but for now that is where we are. The tipping point margin is a metric that looks pretty noisy over the past few weeks, so I would urge caution reading much into individual daily ups and downs. A lot of that is just going to be statistical noise. 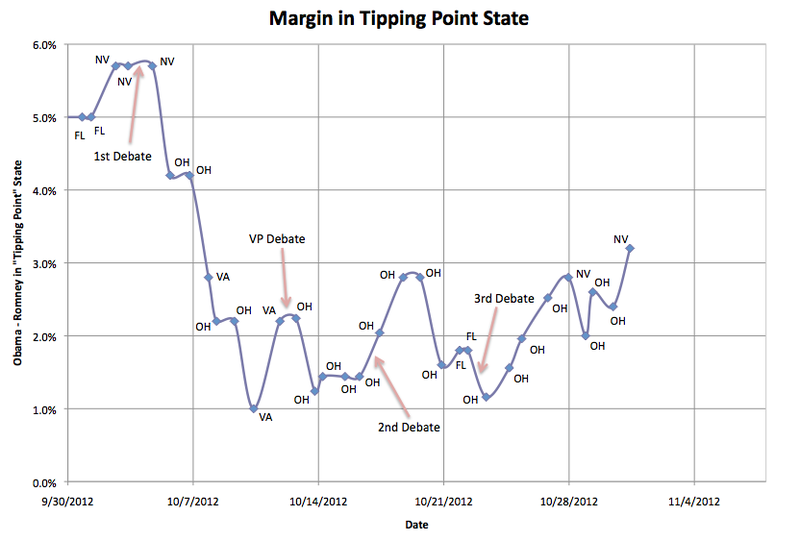 However, this represents the best margin in the tipping point state Obama has seen since October 7th in the midst of his downward plunge after the first debate. 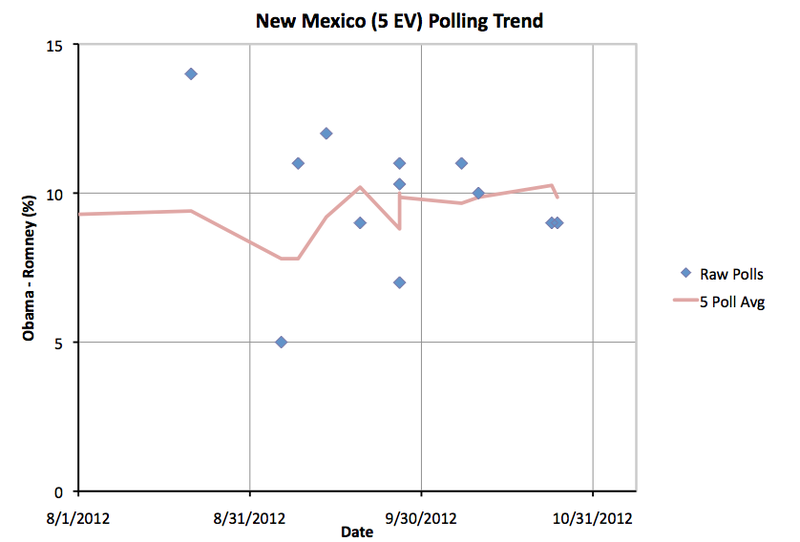 The upward trend in this measure of the state of the race is now looking more clear. Tick tock. The time left for Romney to make a move in the polls is diminishing quickly. Will something gain traction? If not, then Romney’s main remaining hope is that all the polls, not just those from Democratic leaning pollsters, but all of them, are actually wrong and are systematically tilting toward Obama. This is not impossible, and along with the possibility of a last minute event that changes things, is likely a big part of why sites like 538 give Romney a 20%+ chance of winning. 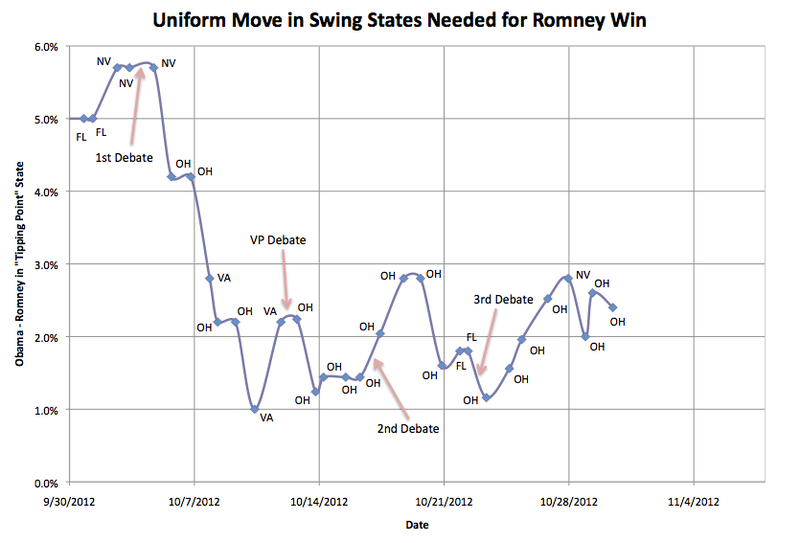 Views of this using just the raw polling data, like that done by Darryl at horsesass.org give a much lower chance of a Romney victory. 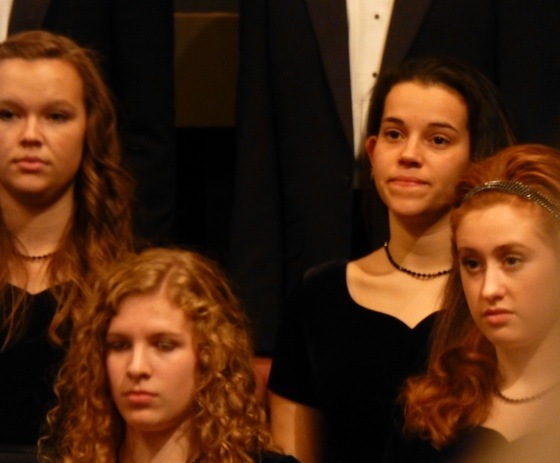 But then there is Sandy. Michael, A commenter on yesterday’s update, brought up the possibility of reduced voter turnout in areas of Pennsylvania affected by Hurricane Sandy making the state winnable for Romney. Unlike potential effects on popular opinion of Obama due to how he responds to the hurricane, turnout effects due to the storm may simply not be measurable by the polls. First of all, the degree to which any remaining issues from the storm may impact voting on Tuesday may not be clear until almost Tuesday. Second, because people in effected areas are busy dealing with the storm impact itself, they may be more reluctant to participate in polls, and some pollsters may not even bother trying. Now, most people seem to think that the effects of the storm on actual voting next Tuesday will be minimal, as most services will have been restored by then, etc. But for argument’s sake, lets imagine that turnout in the Philadelphia area is significantly reduced, giving Pennsylvania to Romney despite Obama’s 4.6% lead in current polling. Let’s also give Virginia to Romney on the same basis… reduced turnout in Northern Virginia breaking what is essentially a tie in Virginia at the moment, and giving the state to Romney. 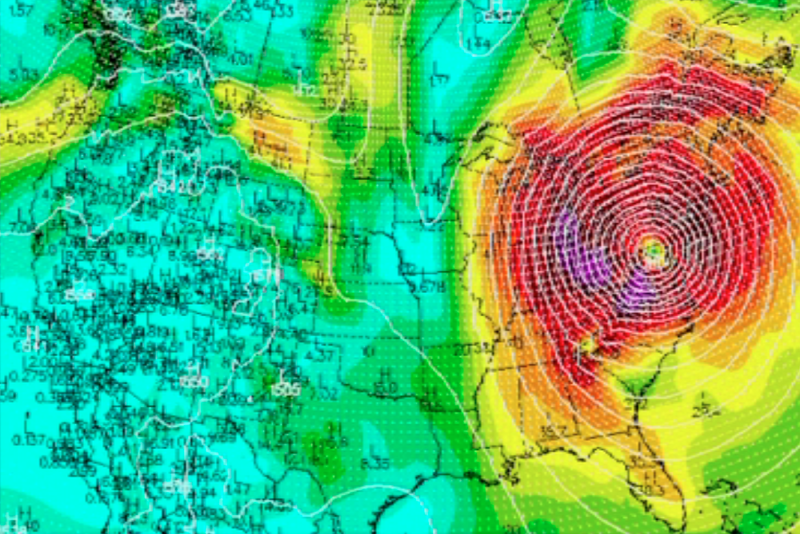 If Hurricane Sandy was indeed able to deliver Pennsylvania and Virginia for Romney, Obama would STILL be ahead… but it would be a LOT closer! For the moment though, as long as that scenario does not develop, Obama’s position seems to be better now than it has been in weeks. He is increasing his lead in Ohio and other swing states. Even if you grant some movement toward Romney in Pennsylvania and Virginia that isn’t visible in the polls, it seems like Romney still needs something else to move things in his direction. Before the hurricane, Romney’s camp seemed to be trying (but failing, at least in the critical states) to gain traction based on the Obama administration’s handling of the attacks in Benghazi on September 11th. Maybe a renewed push on that issue in the remaining days will do the trick? The Romney campaign has also been pushing hard in Ohio with an attack implying Obama’s policies are resulting in Jeep moving jobs from Ohio to China. Fact checkers have called these claims misleading at best, but that doesn’t necessarily stop the attack from being effective. Maybe that will start reversing the polling trend in Ohio? 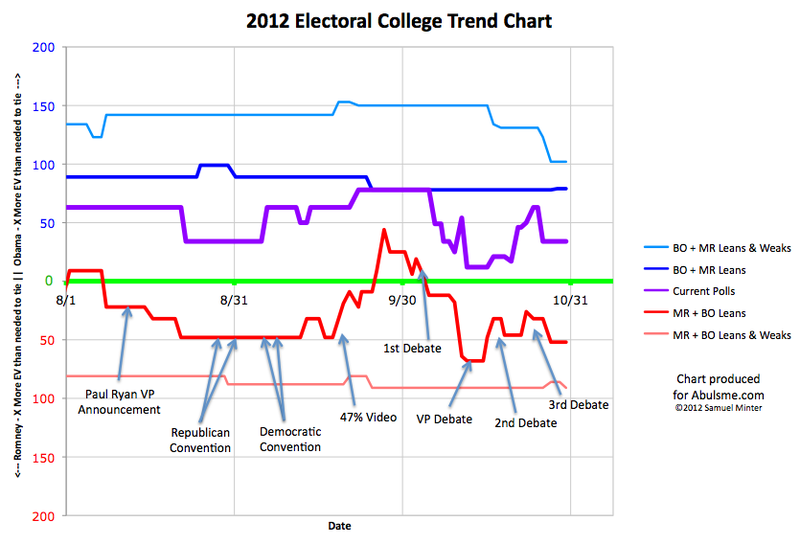 Or will there be some new event that moves things dramatically toward Romney? Note: I actually finished my daily sweep of the polls about 10-11 hours prior to making this blog post. I usually try to keep that gap shorter, but it is what it is. There have of course been new polls released in that time. Those will be included in tomorrow’s update. While New Mexico is colored lighter blue on the map, the summary is unchanged from yesterday, since New Mexico wasn’t moving in or out of “swing state” status. OK, in my recent posts I’ve listed the swing states, listed their margins, and then mentioned which states Romney would need to win if he took them “in order” by how well he is doing in the state. When you do this, one state would put Romney over the top. 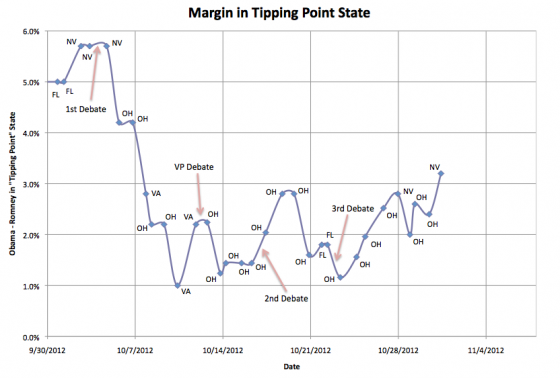 I then looked at the margin in that “Tipping Point” state. In other words, if Romney improved his margin by the same percentage across the board in all states (or at least all the swing states) how much better would he need to be doing in order to actually win enough of those states to win the electoral college? I base these margins off my five poll average rather than something more sophisticated, but the general concept of this is similar to Sam Wang’s “meta-margin” at the Princeton Election Consortium. It shows another way of looking at the race, and one which gives a closer look at who is ahead and by how much than simply looking at the three model lines I usually present. With the three lines I normally present you can tell who is ahead and that it is relatively close, but it is hard to get a sense of exactly how FAR ahead the candidate in the lead is when it is “close”. So anyway, what does this show? Well, basically the same trends we see in Romney’s Best case line and the current line. Namely, the first part of October Obama was in free fall, but that stopped around the time of the VP debate, and since then there has been a pretty noisy signal, but with a slight trend toward Obama. 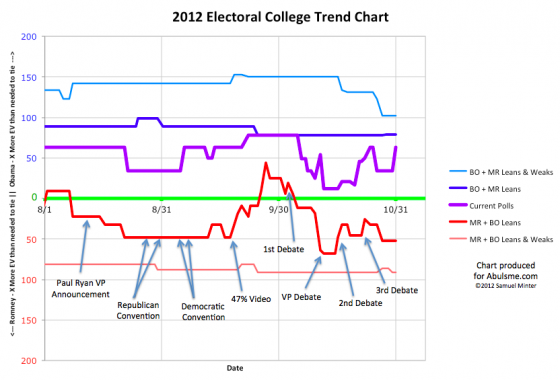 If you are generous to Romney, you can say that the trend has been flat since the VP debate, but any argument that there has been continuing Romney momentum is clearly false. The “tipping point state” has almost always been Ohio, with a few days here and there when polling moved states slightly out of their normal order. But be it Ohio, or occasionally Florida, Virginia or Nevada, Obama’s lead in the tipping point state has been staying in a fairly consistent band between 1% and 3% for the past three weeks. Obama is no longer in the comfortable territory he was in before the 1st debate, where Romney would have to move the tipping point states by more than 5% to win… a state I described before as Romney’s best case being to lose. But he has a buffer there, and, so far at least, the key tipping point states are not showing the moment Romney would need in order to win. Now, if something were to happen to induce a move as large as the decline Obama had at the beginning of October, then yes, that would potentially still be enough to flip the race. As I type these words though, there are 7 days and 55 minutes until the first polls close on election day. There is very little time left for a last minute change large enough to flip this to Romney. It could happen, it is just becoming a bigger and bigger stretch with every day that goes by that does not move things dramatically in Romney’s direction. Meanwhile of course, even while NO electoral college model that I’ve seen has put Romney ahead at ANY time in the past year, all the aggregators of national polls have shown Romney ahead for almost all of the last three weeks, and that lead continues today. If nothing happens to shake things up in the next seven days, the prospect of an electoral college / popular vote split seems to get more likely by the day. Edit 2012 Oct 30 22:43 UTC to fix some wording issues. 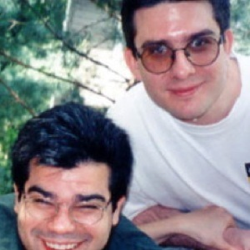 Edit 2012 Oct 30 23:19 UTC to fix typo. Mortgage Refinancing / Election Update / EV-PV Split?